Unveiled two weeks ago, the metal-clad Moto E4 and Moto E4 Plus are slowly making their way to various markets. After being launched at Verizon earlier this week, the Moto E4 seems to be ready to take on the European markets. 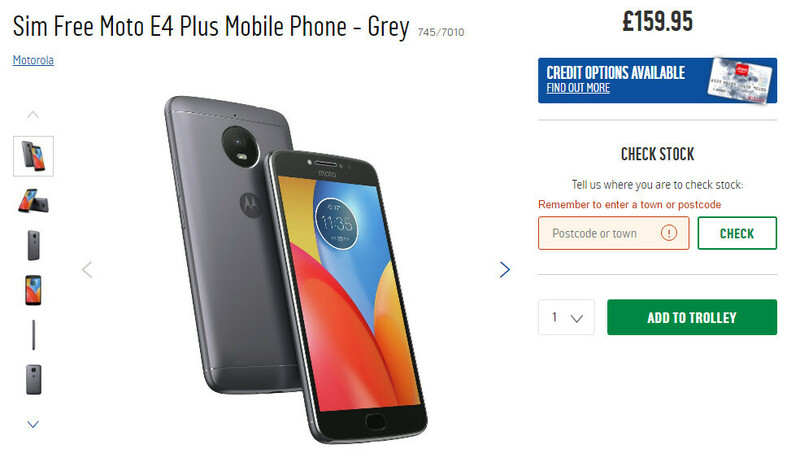 Still, the Moto E4 Plus is the first to hit shelves on The Old Continent, as customers in the UK can now order the smartphone for just £159.95 at Argos. The handset is expected to cost around €200 in other European countries, while the standard Moto E4 is priced to sell for €150 outright. The SIM-free Moto E4 Plus now available in the UK, comes with pretty decent specs despite the fact that it's not a high-end device. The smartphone runs Android 7.1.1 Nougat right out of the box and features a metal design. On the inside, Motorola's mid-range handset is equipped with a 1.3GHz quad-core MediaTek MT6737 processor, 2GB RAM and 16GB of expandable storage. One of the phone's main selling points, the massive 5,000 mAh battery promises to offer 510 hours of standby time or 22 hours of talk time. The European version of Moto E4 Plus sports a 5.5-inch display with HD (720p) resolution, as well as a 13-megapixel rear-facing and 5-megapixel selfie cameras. A fingerprint scanner is positioned under the Home button too.